Karpen conceptualized his invention in what seemed like a flash of lightening. 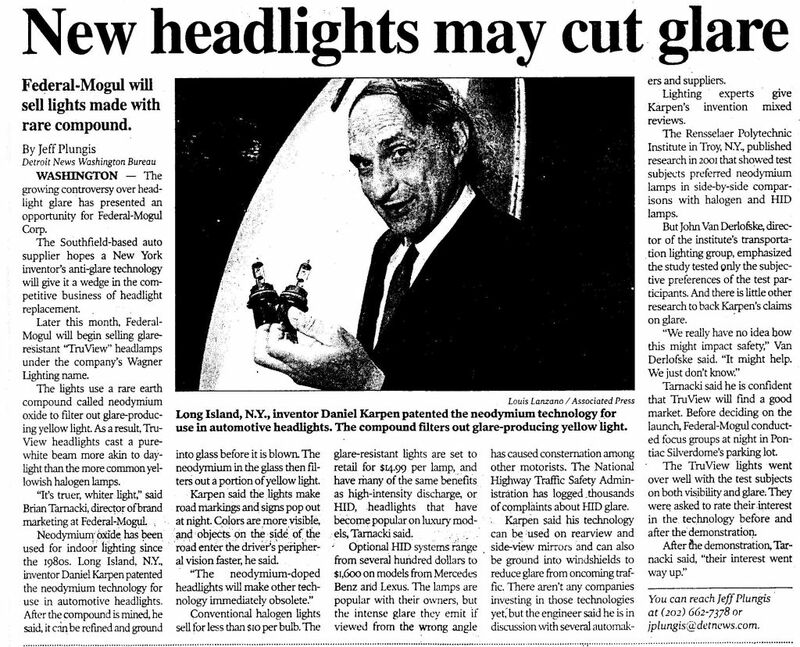 He realized that neodymium oxide light bulbs — the type that transmits this white light — provides better lighting and replaced all the bulbs in his house with these in 1988. Upon driving upstate in an old Dodge Dart in the summer of 1989, it occurred to him that they would also be helpful on the road. The growing controversy over headlight glare has presented an opportunity for Federal-Mogul Corp. The Southfield-based auto supplier hopes a New York inventor's anti-glare technology will give it a wedge in the competitive business of headlight replacement. Later this month, Federal-Mogul will begin selling glare-resistant "TruView" headlamps under the company's Wagner Lighting name. The lights use a rare earth compound called neodymium oxide to filter out glare producing yellow light. As a result, Tru-View headlights cast a pure-white beam more akin to daylight than the more common yellowish halogen lights. optional high-intensity discharge headlamp systems that sell for up to $1,600 in some premium vehicles. Though popular with owners—especially in Europe—HID lamps have been blamed for excessive glare and currently are under study by the U.S. National Highway Traffic Safety Administration. It has long been recognized that visual discomfort from the glare from motor vehicle headlights has been a vexing problem that has remained unsolved until the present time. This article presents a novel solution to the problem of headlight glare which will eliminate much of the disability and discomfort. In addition, it will provide better illumination for the driver. ...Federal-Mogul is marketing headlamps made with neodymium-doped glass. "It filters out more of the yellow light and essentially allows your eyes to pick up more of the blues and the reds," Federal-Mogul's Keith Bucher says of the glass, which is infused with neodymium oxide. The resulting effect reduces glare from another vehicles' headlamps, and your ensuing eye strain. Daniel's investigations have shown that glare is reduced when viewed through glass containing a light dose of the rare earth element neodymium. As little as 3 percent by weight is enough, adding perhaps $5 to the cost of windshield glass for an average car. The Wagner Lighting Division of Federal Mogul Corp. has been producing neodymium-oxide-dosed headlights. Schott Glass Technology has plans for manufacturing mirror glass containing neodymium oxide. (It's claimed this would obsolete the two-plane flip-up mirrors now in use.) And Karpen's latest patents incorporate the compound into automotive windshields. Neodymium Oxide, as a component of glass, selectively filters out a portion of the yellow light. Neodymium Oxide can be incorporated into the glass of a headlight lamp, the rear view mirror, and the windshield of a motor vehicle. A series of tests was conducted with 30 subjects recruited to quantify the reduction in glare and improvement in vision buy the use of Neodymium Oxide doped glass for these applications. Subjects were put through a series of tests in an optometric examination room setting. The group was then divided in half, and one half received new standard headlights, and the other have received Neodymium headlights in a road test. Windshields have remained unchanged for the past several decades. Meanwhile, the problem of headlight glare is getting worse with the advent of the brighter headlights. A novel approach is presented in this paper by doping the windshield glass with Neodymium Oxide, a rare earth compound, to filter out the excess yellow light. Research results indicate that 0.042 lbs/sq ft (0.362 Kgs/sq meter) maximizes glare reduction while minimizing the amount of Neodymium Oxide necessary. Headlight glare us a continuing problem that has resisted efforts to solve it until now. A novel approach is provided in this paper by doping the glass with Neodymium Oxide, a rare earth compound, to filter out the excess yellow light. Neodymium Oxide dopes lighting improves black and white contrast, so one can see road markings easier. The primary colors red, green and blue are enhanced with increased saturation, making them easier to see at low levels of illumination. Preliminary results indicate that "spots in your eyes" are reduced in intensity and in duration in the visual field. Apparently glare is reduced by a factor of 6 or 7 compared with standard lamps. This report documents the work done in a Safety IDEA research project on the visual effectiveness of Neodymium Oxide doped headlights, rear view mirrors, and windshields in reducing glare and improving vision. This research project had two stages: clinical optometric experimentation under controlled conditions, and a subjective road test. Truck divers with commercial driver's licenses were recruited by advertising in local newspapers on Long Island. The subjects were all given a standard optometric examination. Of the 30 subjects, who were paid for their participation in the study, 29 needed a new optometric prescription. Another 14 had significant eye pathologies. Subjects were both male and female and ranged in age from 29 to 75, with just 2 subjects under 40 years in age.